Are you a cat person, or a dog person? A raptor person, or a dragon person? Or a kangarooster person? There are a lot of choices, and they're all from our reprints coming out in December and January. There's something here for you whether you like your pets to be mischievous feline YouTube stars, terrifying hybrid monstrosities, or eagles that don't mind being mounted. The munchkins must maraud to meet Moop's mixed-up minions! The first printing came out earlier this year, but this Munchkin game is selling so well, we had to print it again! 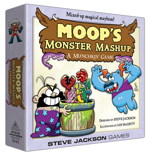 Moop's Monster Mashup is a standalone game in which the munchkins must defeat the malevolent magician Moop, who is using his magic powers to create mashed-up monsters like the Kangarooster we mentioned earlier. The second printing is getting a deluxe treatment, so it comes with a game board and character standies. The second printing should be out in time for the holidays. Play this game right meow. This is another game we released for the first time this year that's just selling so well we had to print more. 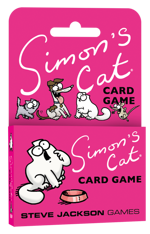 People are buying up this fast-playing card game based on the hit YouTube series Simon's Cat. You play as Simon's pets. Play cards to make sure Simon doesn't notice you. If he does, you get Blame. Get too much and you get fed last. Like Moop's, this reprint should be out in December. 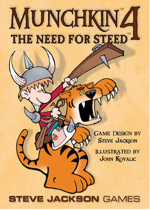 Ah, The Need for Steed – the origin of the Munchkin mechanic that allows players to ride around on animals, cryptozoological creatures, and sometimes people. It's due for another reprint, which will hit stores in January. This Munchkin expansion with original fantasy backs and art by John Kovalic introduces Steed cards, which grant bonuses like the ability to run away more reliably, or to carry more Big items. Visit your local game store today to put in your preorders!